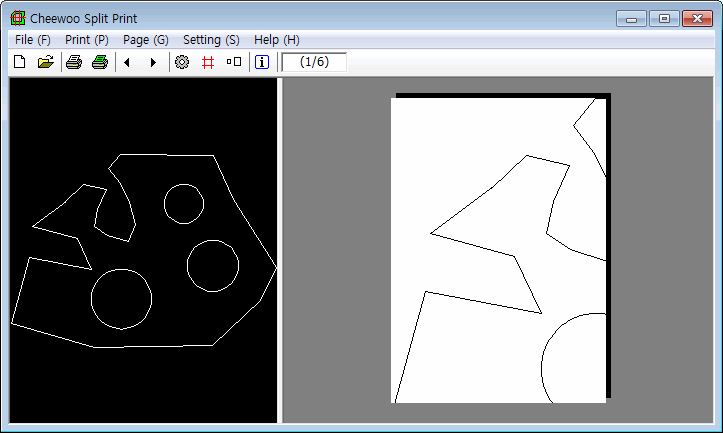 Dividing and printing big shape object in a DXF / DWG file to multiple small conventional size papers (i.e. A4, A3, 8.5x11, 8.5x14 size etc.) to make a big paper drawing by assembling the multiple printed papers. Supporting to make big drawing to use only conventional size papers without special big printer / plotter. Providing scale ratio (the ratio in between drawing unit length vs. printed paper drawing unit length) adjustment setting. Providing previews of the multiple pages for checking each divided page before actual printing start. Supporting to print current page and / or all pages. Supporting to print boundary rectangle guide line for easy and accurate cutting / joining. Requires Windows 2000 or above, RAM512 MB,10MB HDD or above. CAD,DXF,DWG,Split,Print,Program,Software Supporting to make a full size big drawing by joining the multiple small size printed papers. Providing scale ratio adjustment setting. Providing preview of the each divided pages and boundary guide line feature.